Not as clumsy or random as a Rocket Punch! Well today was Fathers Day. 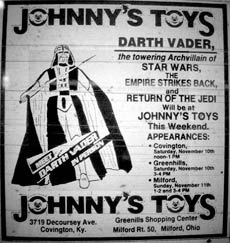 Since my dad lives a couple thousand miles away I did stuff that reminds me of him like compiling all the newspaper ads I've collected for Darth Vader store appearances from 1977 through 1984. Yeah Darth Vader reminds me of my dad, but not in that "I killed them all, even the younglings!" kind of way. 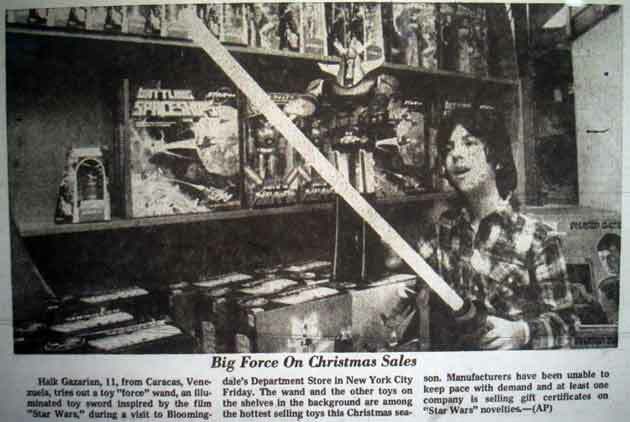 When I think of that first Star Wars movie I remember how my dad was the one who introduced our family to Star Wars by taking us to the drive in to watch it over and over. He gave me the Star Warses and a father can give a son no greater gift. So far all I've introduced my son to is Yo Gabba Gabba and some bootleg DVDs of Tranzor-Z. Based on those two shows I can't tell if he's going to grow up thinking I'm great or if he's gonna sue me for a refund on his childhood or demand some sort of inter-generational restitution like that. Unlike the generations before him, my son will spend his childhood years in a world untouched by the direct hand of George Lucas. By the time my kid achieves sentience at around the age of nine or ten, Lucas will have retired and will no longer be making (or remaking) anything. It's a brave new world for him, one I can't imagine living in. My generation gave Lucas incredible power. He surrounded us and penetrated us and binded us all together. He became so powerful he even achieved the ability to erase millions of peoples' childhoods! Every time he created or messed with the old Star Wars movies he was in effect rewriting our lives as we remembered them. 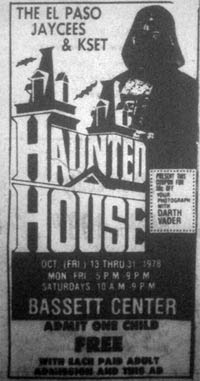 The millions of people who grew up in the late 70s reading the old Marvel Star Wars comics and believing Han shot first had large chunks of their childhood deemed non-canon or even erased by George Lucas. My son will never know the anxiousness and worry my generation felt each time we enjoyed something Star Wars under the looming threat that the whole experience would be nullified by the next official G Level canon Star Wars release. 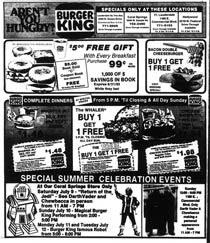 But we learned to cope with the anxiety, consoling ourselves with the thought that as long as that time we saw Darth Vader at Burger King in 1983 didn't directly contradict anything that happened in the movies we were probably okay. 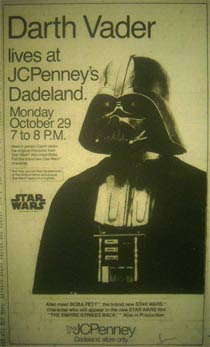 So in celebration of Fathers Day and all those possibly canonical times that the Galactic Empire included the shopping center a couple blocks down the street I have constructed this montage of classic Darth Vader store appearances culled from various blogposts and facebookings I have written in the past. 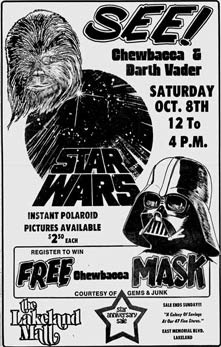 The centerpiece is a really cool, never-before-seen-by-me-until-last-week newspaper ad from a store called Hecht's that just may be the nicest Darth Vader appearance promo I have ever found. 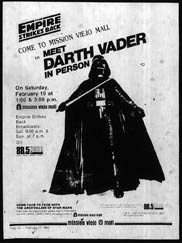 And as an added bonus you should check out the interview at StarWars.com with Bryce Eller, the guy who used to dress up as Darth Vader for all the official appearances early on in Darth's galactic publicity tour of the late 70s/early 80s. I hope your Fathers Day (and childhood) was most impressive. No refunds!